A team of ex-Googlers, with backing from Y Combinator, the Friendfeed founders and others, have created what might be both the ugliest and most useful group productivity app we’ve seen. 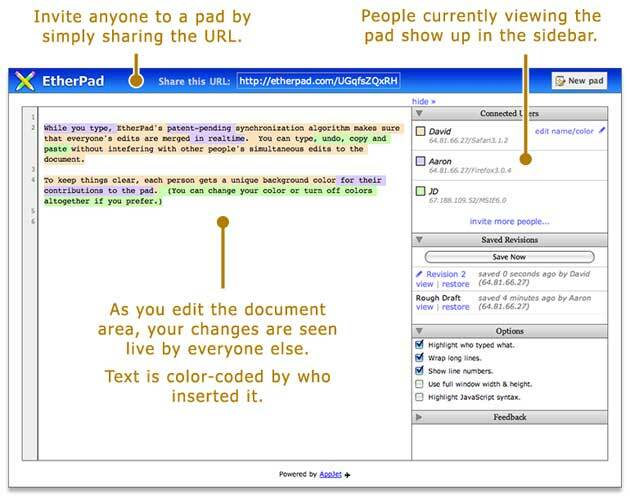 Etherpad, a new product from Appjet, launches this morning, and you must try it out. It’s comparable to Google Docs or a wiki, but it’s far more useful. You start off by creating a new workspace. You type basic text on numbered lines at will. Then invite someone else in and have them type as well. Each user’s edits are highlighted a different color. Changes are made in absolute real time, something even Google hasn’t been able to do (Google docs update every fifteen seconds). In the future, co-founder Aaron Iba says that they’ll have features for exporting documents into text files, Word format, etc. Eventually they’ll offer businesses premium features for a fee, like controlled access, private URLs, etc. They’ll even offer non-hosted version that companies can install on their own servers for higher security. This instantly became a must-use application for me. It makes phone calls a lot more productive – just open up a workspace and take notes together, in real time. Like Yammer (which spun out of Geni), Etherpad wasn’t the core focus on the company (see our previous coverage of Appjet here and here). Iba says the team needed a tool like Etherpad and just created it for internal use. Now they’re unleashing it on the rest of us, which is quite nice of them.